The compliments of the Season to all Nelson, New Zealand and Seido Karate Students throughout the World. Here in Sunny Nelson we send our best wishes to everybody for a healthy 2018. Lets continue to use our practise to make us more patient and our lives and the lives of people around us just a little better. The Nelson Shibu Dojo closes for 2017 with Black Belt class on Wednesday 20th . We reopen for 2018 on Saturday 13th January with One General class at 10.30am. 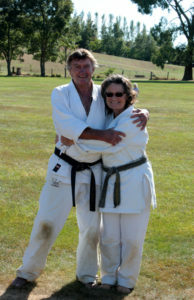 Hanshi Andy, Sei Shihan Jane & Barber family.